The Heroes of Sovngarde can be found in the Hall of Valor located in Sovngarde. All of them are Nord warriors and they are also all essential. 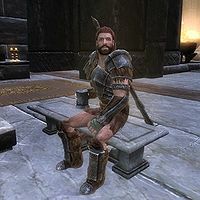 They can be found sitting for a drink, listening to the bards play and conversing with each other. 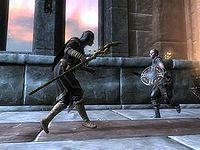 From time to time those of the Heroes who belong to the Sovngarde Sparring Faction will offer one of the fellows to satisfy their thirst for battle in a friendly combat match in the west wing of the Hall. "Why does Shor forbid us to face Alduin? I fear no worm, World-Eater though he be." "Far you've travelled, your trials long, to taste of Sovngarde's sweet delights." "Seek ye food or song unending? Fighting, drinking, fellowship and boasting? Find welcome here, and warm your soul." "Hail, Dragonborn. That honor is also mine - to our shared birthright you'll bring new glory!" "Dragonborn! Have you come to cleanse Sovngarde at long last of Alduin's foul mist?" "I long to fight that foul worm, but by Shor's command we curb our wrath." "No gloom can hold my heart for long in Shor's bless'd hall, where no shadows lie." "A cup, Dragonborn, to death and glory!" "Take your ease, let troubles fade." "By Shor's command we curb our wrath, so we feast and sing, til the final doom." "Shor's power protects this hall; but beyond is fear, brought by Alduin." "Shor's high seat stands empty; his mien is too bright for mortal eyes." This male Hero prefers to watch sparring matches between his fellow Heroes rather than taking part in them. Thus he stays in the west wing most of the time, wandering from one spectator's seat to another or sipping mead. He rarely leaves fighting area for a brief feast at the table by the grand fire in the central part of the Hall. On his way back to the sparring ring area he may linger for a moment at the fire warming his hands or raising a mug with another Hero, but then he rushes back to await yet another combat match. This Hero wears studded armor with a pair of hide boots. He carries both a leveled one-handed weapon and a leveled two-handed weapon, both of which may be up to honed ancient Nord in quality. He also has a fifty-percent chance to carry an iron shield. 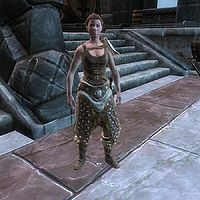 This female Hero wears studded armor with a pair of hide boots. She carries both a leveled one-handed weapon and a leveled two-handed weapon, both of which may be up to honed ancient Nord in quality. She also has a fifty-percent chance to carry an iron shield as well. 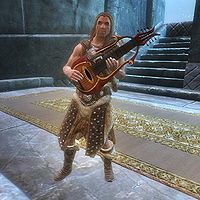 This male Hero is a bard and can be found entertaining the other Heroes in the main feasting area of the Hall of Valor, at the empty throne of Shor, never eating, sleeping, or moving from his performance spot. He can play both the lute and the flute, but does not sing. This Hero wears studded armor with a pair of hide boots and does not carry anything. This male Hero wears studded armor with a pair of hide boots. He carries both a leveled one-handed weapon and a leveled two-handed weapon, both of which may be up to honed ancient Nord in quality. He also has a fifty-percent chance to carry an iron shield as well. 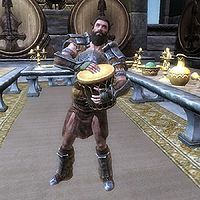 This male Hero is a drumming bard and can be found performing between the feasting tables in the east wing of the Hall of Valor, constantly playing his drum. 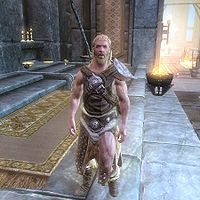 He wears ancient Nord armor with matching pairs of gauntlets and ancient Nord boots and does not carry anything. 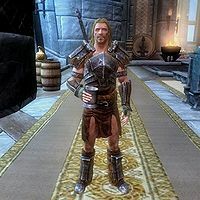 This male Hero wears ancient Nord armor with matching pairs of gauntlets and ancient Nord boots. He carries a leveled one-handed weapon and a leveled two-handed weapon, both of which may be up to honed ancient Nord in quality. He has a fifty-percent chance to carry an iron shield as well. Most of the time he stays around the grand table in the central area of the Hall beside the empty throne of Shor. 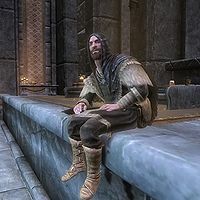 Alongside Ysgramor he can be seen either sitting at the table or standing near it, listening to the masterful performance of the bard Hero. From time to time this Hero would set off to the west fighting wing to quench his battle thirst with another Hero, but afterwards he always returns to his usual site. This female Hero can be found restlessly pacing through the entire Hall of Valor. The only area she avoids is the spectators seats in the west fighting wing since she prefers to participate in the sparring matches, rather than watch them. Besides fighting in the sparring ring she takes a break from her long walks only to sit at one of the many feasting tables, warm her hands at the grand fireplace in the central area or to get a sip of mead. She wears a random set of steel armor with no helmet. 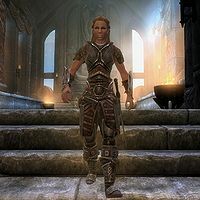 In combat she wields either a leveled one-handed weapon or a leveled two-handed weapon, both of which may be up to honed ancient nord in quality. She also could carry an iron shield with a fifty percent chance. 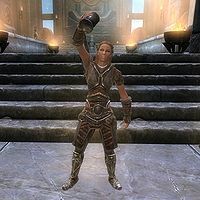 This female Hero is the member of the Sovngarde Sparring Faction therefore from time to time she could be seen fighting with one of her fellow Heroes in the west wing of the Hall of Valor. Aside from sparring she takes pleasure in walking around the Hall, warming her hands at the fire and sipping mead. She may sit at any of the feasting tables to enjoy food, but only for a short while. She wears a random set of steel armor, minus the helmet and carries both a leveled one-handed weapon and a leveled two-handed weapon, both of which may be up to honed ancient Nord in quality. She also has a fifty percent chance to carry an iron shield. This female Hero is active in her afterlife: together with drinking mead and enjoying always fresh food at the feasting tables, she finds pleasure in strolling through all three main areas of the Hall as well as participating in sparring matches with other Heroes. She also can be seen warming her hands at the grand fire or leaning on the wall overlooking east mead wing. This Hero wears a random set of steel armor without the helmet. 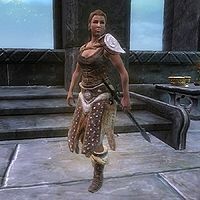 In combat she chooses between either a leveled one-handed weapon or a leveled two-handed weapon, both of which may be up to honed ancient Nord in quality. When wielding a one-handed weapon she might also rely on an iron shield, which she can carry with a fifty percent chance. This Hero is one of the three mages sharing honorable afterlife in the Hall of Valor. She prefers to stay around the table at the empty throne of Shor in the central part of the Hall alongside Ysgramor. However, from time to time she accepts or initiates a sparring match with one of the fellow Heroes in the fighting wing. In combat she wields Staff of Chain Lighting. Once both combatants have satisfied their battle thirst she is back to the feasting routine and conversing with her comrades around her usual table. She wears a pair of Archmage Boots and an unhooded set of Archmage Robes. 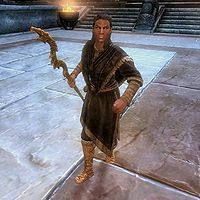 This male Hero is one of three mages in Sovngarde. He wears a pair of Archmage boots with a hooded set of Archmage's robes and carries a Staff of Expulsion. This Hero prefers to stay in the west wing to watch sparring fights between his fellow Heroes or enjoy his solitude in the spectators sitting area. He can be found there either eating, drinking or sitting on the ledge. For a short while he may leave the fighting ring for a quick feast at the table in the central area of the Hall of Valor. Although he almost always stays in the sparring area he only observes combat matches but never participates in them. 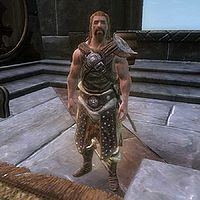 This male Hero is one of three mages in Sovngarde. 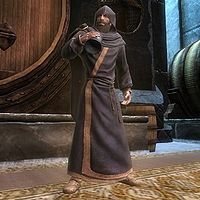 He wears set of blue mage robes with a pair of boots and carries a Staff of the Storm Atronach, which he never uses since he does not participate in fighting matches in the west wing. He usually feasts in the east wing either taking a sit at the table or sipping his mead closer to the huge kegs. From time to time he leaves the east wing to walk around the grand fire in the central area of the Hall and then returns to the wing of mead and drum rhythms. 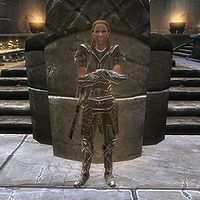 This male Hero wears ancient Nord armor with matching pairs of gauntlets and ancient Nord boots. He carries both a leveled one-handed weapon and a leveled two-handed weapon, both of which may be up to honed ancient Nord in quality. He also has a fifty-percent chance to carry an iron shield as well. This Hero prefers mead and drum performances of the east wing and can be found either sitting at one of the tables or standing closer to the mead kegs. From time to time he leaves the feasting wing to walk around the grand fire or to participate in one of the sparring fights. Hero#1 "I long to fight that foul worm." OR "Shall Alduin remain so long unchallenged?" Hero#2 "Ease your heart, our honor is unstained - it's by Shor's command we curb our onslaught." OR "It is by Shor's command that we curb our wrath - so let's feast and sing 'til our fate calls us. Let us not spurn our lord's bounty - this hall is his gift, for glory well-earned." Hero#1: "I crave a tale of tall ships and fearless heroes, for heart's ease." Hero#2: "Listen well, friend, and lighten your mood while words I'll spin of warriors bold, whose deeds of valor brought undying fame." Hero#1: "Come, let us share a cup of mead, and trade tales of our time on Mundus, reliving the glory of our remembered deeds." Hero#2: "A cup I'll gladly raise in company with you. None have yet bested me in boasting or drinking." Hero#1 "Hail, comrade! Shall we by clash of steel ease the gloom of the encompassing mist?" OR "My blade is restless, unblooded too long." Hero#2 "Aye. Let us forget our sorrow in the fury of battle." OR "Meat and mead must ever make way for the clash of steel - the song of battle." Hero#1: "Well fought, friend. Your fury is unmatched." OR "By a bold stroke, you bested me, friend." Hero#2: "Shor's favor found me today. Let's lift a mug of mead together, our wounds to salve and weariness cure." OR "With mead and fellowship let's mend our wounds." This page was last modified on 11 April 2018, at 19:10.